It's OwlCrate time! Whoop! As always, I'm extremely excited to share with you guys the contents of an OwlCrate and what I thought about it. Receiving my OwlCrate box is one of my favourite parts of each month (no matter what else goes on, haha!) 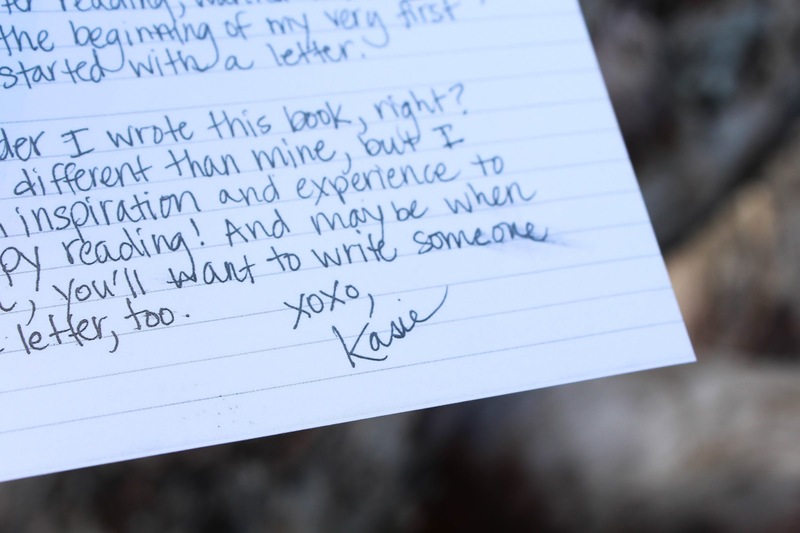 and I hope that you guys enjoy reading these posts as much as I love writing them. For those of you wondering what the heck OwlCrate is let me fill you in. 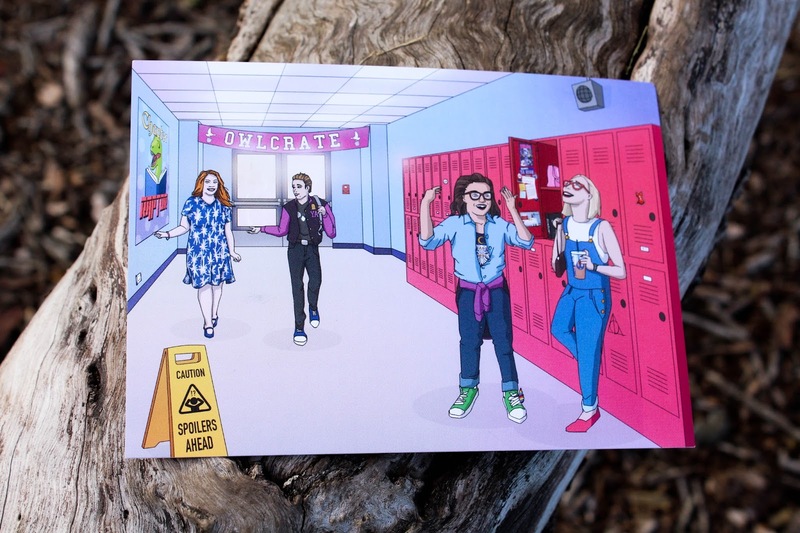 OwlCrate is a monthly Young Adult subscription service run from Canada/USA. Each box contains one new release YA novel (US hardcover edition), 3-4 bookish goodies, and some book swag (usually in the form of signed book plates, letters from authors, etc.) Each box costs $29.99 USD + shipping -- There's a coupon code at the bottom of this post for people who are signing up for the first time/want to send one to a friend! The August OwlCrate had the theme 'Fast Times at YA High' and I have to say I was quite excited for it! I kind of figured that the book would be contemporary, given the theme, and it's coming up to Spring here in NZ, so it's the perfect time to get books like that for reading. 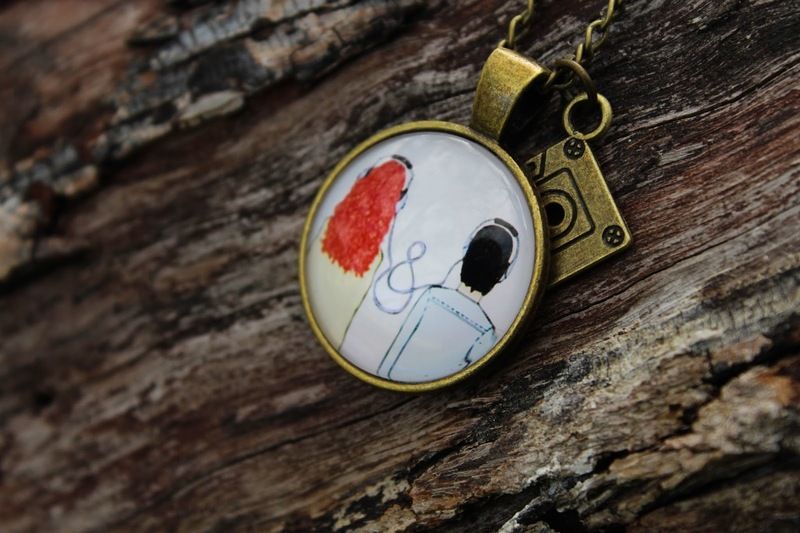 The first item that was included in the box was this Eleanor and Park necklace, designed and made by the team at OwlCrate, which makes it an OwlCrate exclusive! The necklace chain is nice and long, and the cassette tape was a lovely addition to the necklace. It was packaged in this super cute blue bag with the OwlCrate logo, unfortunately, the logo on my bag fell off on it's way over to me, so I didn't photograph it. I haven't read Eleanor and Park yet, but I know that it's a favourite among many YA readers and I adore Rainbow Rowell, so I'll have to give it a go soon! ... I thought the inside covers were so funny and beautifully designed that I couldn't not show you all. 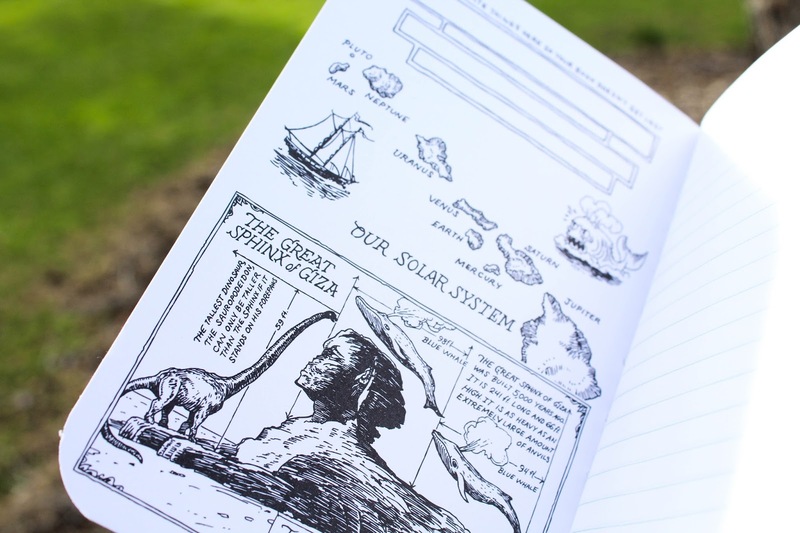 I especially love the drawing in the bottom photograph 'What is behind the stars?' it would make an excellent book! 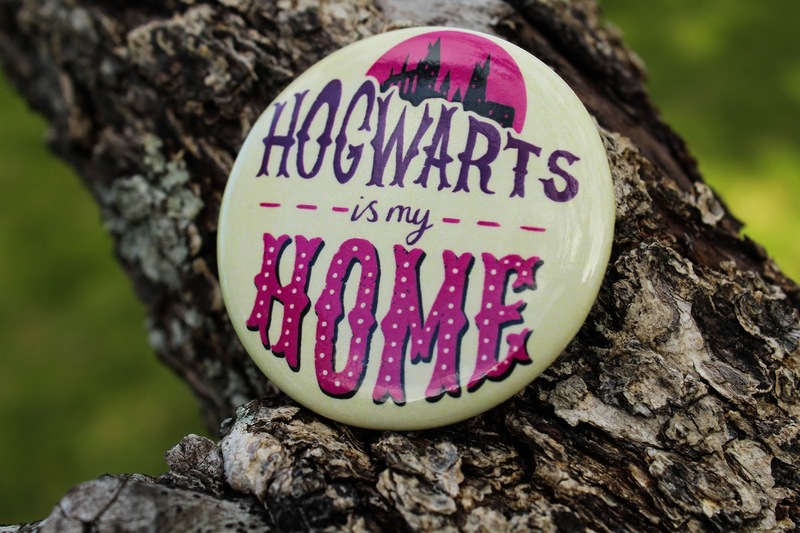 Also included were these badges/buttons, depending on where you're from, that were exclusively created by Taryn Draws. 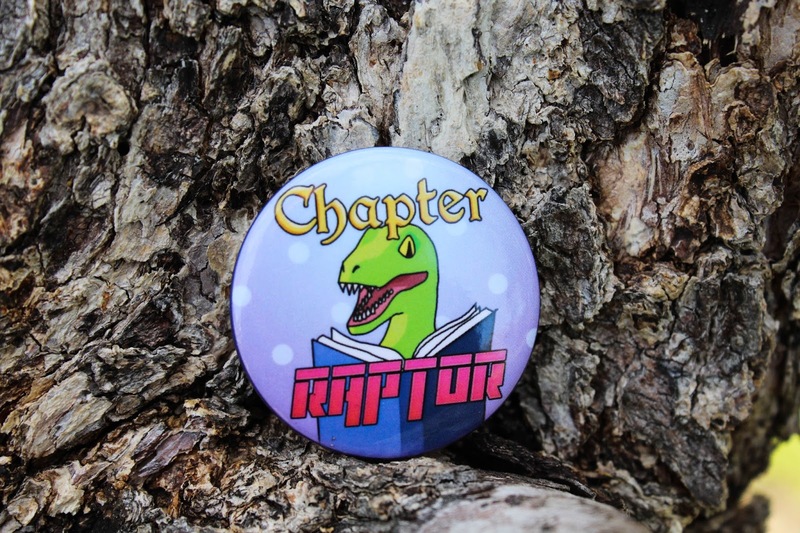 I especially adore the Hogwarts is Home button and the Chapter Raptor one definitely made me laugh! Both badges are really well made, I just hope they don't go to the World of Lost Buttons that magically disappear from all my tote bags. 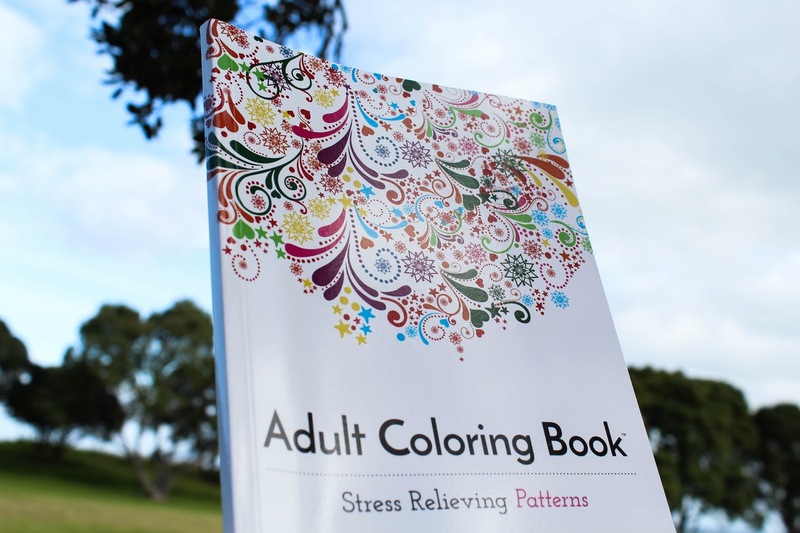 This Adult Colouring Book was the next item in the box with 'Stress Relieving Patterns' inside. 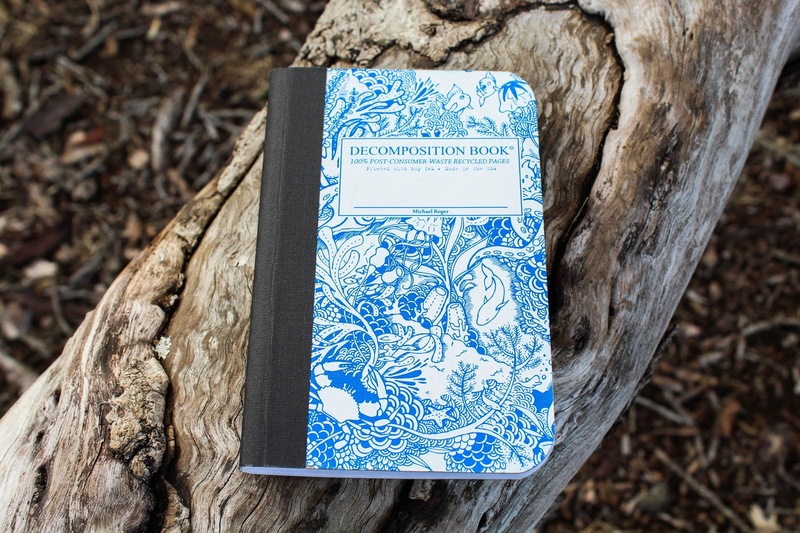 OwlCrate says "Sit back, relax, and bust out the crayons! 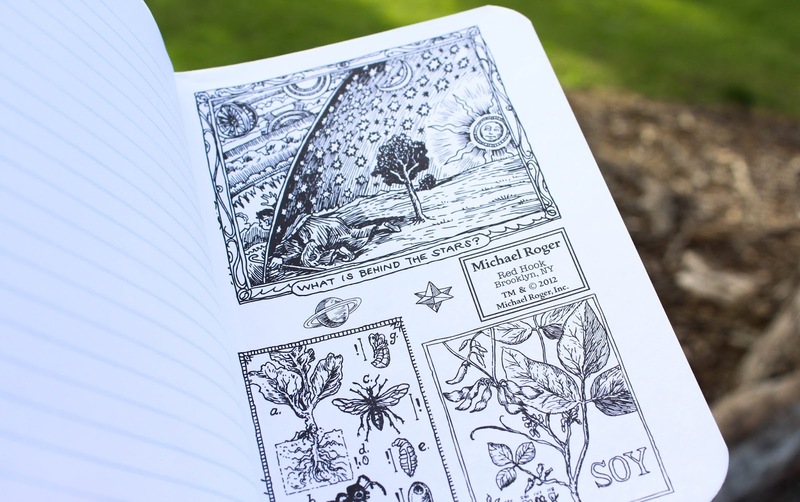 We're huge fans of the adult colouring book trend and we hope it never goes away." -- I'm also a huge fan of the trend, which is why I have 30 unused books sitting beautifully on my shelves... That being said, the patterns in this book are mostly simple and I can't imagine you having to spend all day on them, it was definitely a bonus in my book, some colouring books can be intimidating with their intense two page spreads! On to my absolute favourite (and most anticipated) item in the box! We were given a sneak peak into the August box, that was that Susanne Draws was creating an exclusive print for all OwlCrate members... She did not disappoint! I'm so freaking thrilled with this print, it's beautiful quality and just the right size (I'll be framing mine as I don't want to ruin the back with tape!) 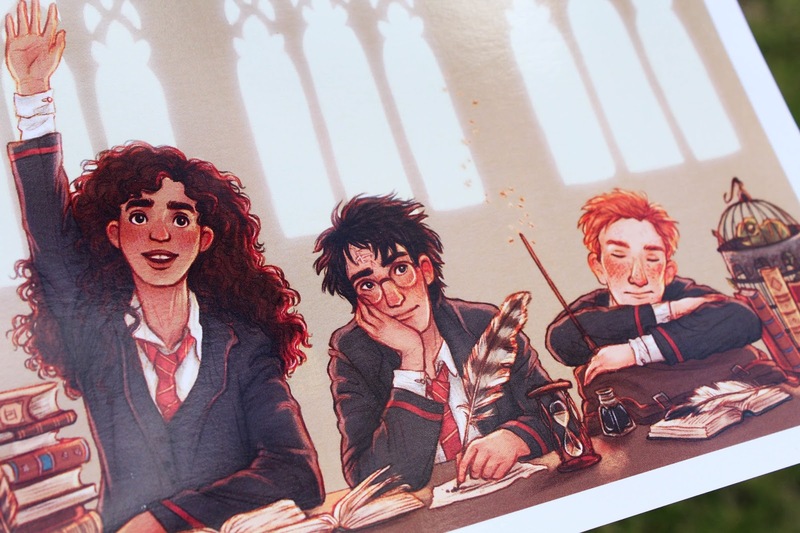 The art beautifully depicts each of the Golden Trio's personalities and makes me so happy that I could cry! I'll definitely be investing in more of Susanne Draw's work soon. 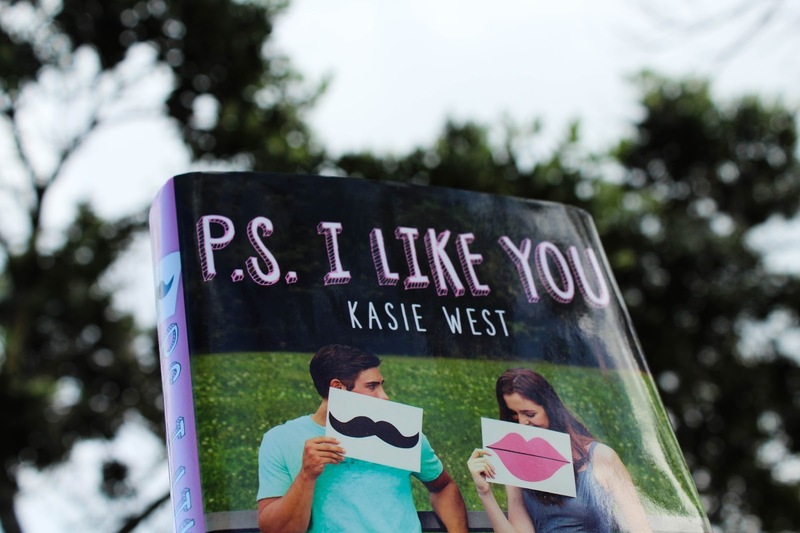 Soon, Lily and her anonymous pen pal are exchanging full-on letters—sharing secrets, recommending bands, and opening up to each other. Lily realizes she’s kind of falling for this letter writer. Only, who is he? As Lily attempts to unravel the mystery and juggle school, friends, crushes, and her crazy family, she discovers that matters of the heart can’t always be spelled out…"
I really like the idea behind this book, and feel like it'll be a quick and cute read that I'll throughly enjoy! 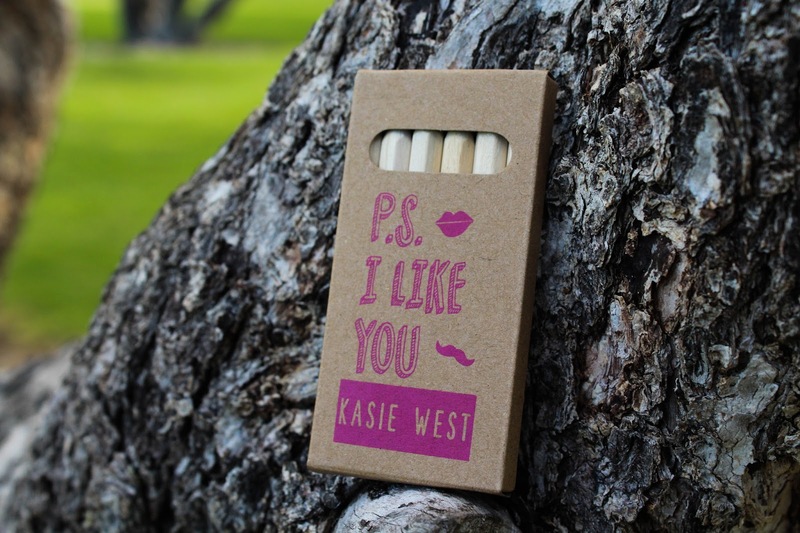 Now, on to the bookish swag that OwlCrate and the author/publisher kindly provide! We received a signed bookplate with really adorable art, a packet of really sweet pencils, and a letter from the author. That's it for the August box! I really liked this box, I did feel as though there were quite a few paper items, more than usual, anyway. The print and the book were my favourite items, what were yours? 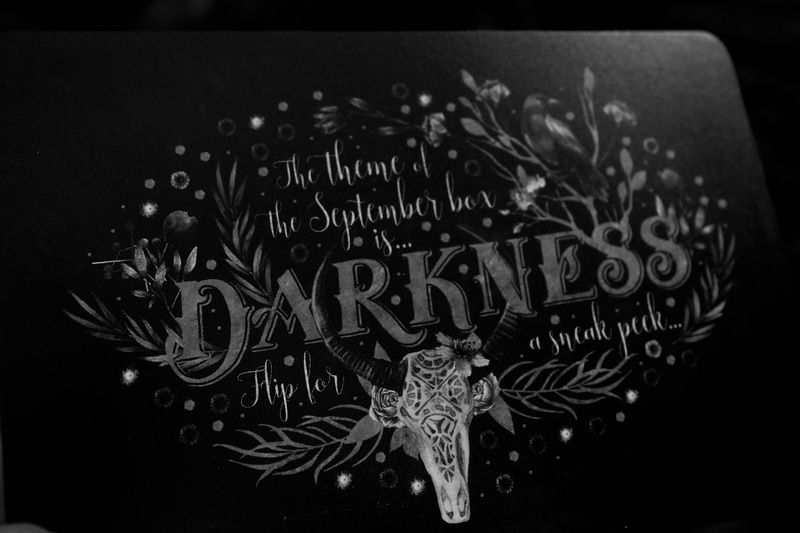 The theme of the September box is 'Darkness' and I have to say that I'm so, so, so incredibly excited for! OwlCrate have said "The September box will include a dark fantasy novel about family, feuds and magic! It will also contain items inspired by Throne of Glass, Miss Peregrine's, Six of Crows and more! We're so thrilled with how this box turned and we can't wait for you to see what's inside! Boxes are limited so make sure to subscribe early if you're interested in this deliciously dark box." Doesn't that sound absolutely fantastic?!?! Let me know in the comments below what you thought of the August box and whether you'll be signing up for the September box!